VANCOUVER — They lost every game. They also won every week. Just have to look deeper than the final score, look beyond the standings. 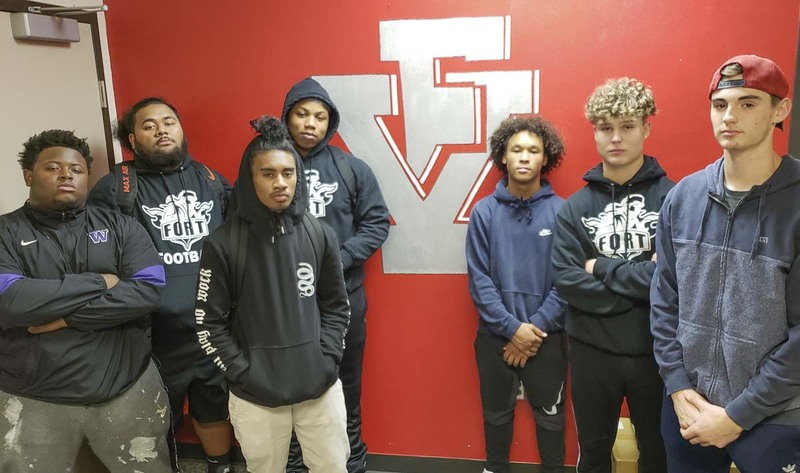 Eight Fort Vancouver seniors walked away from their final high school football season feeling proud. They were there. At the start of the season. At the end of the season. Myron Lawrence. Zjieon Lawrence. Jonavin Salavea. McWayne Ridep. Anthony Wilhite. Nick Laurenza. Tyler Runkle. Tana Heather. Champions, all of them, in their own way. “For the love and the passion of the game. That’s why we kept on playing, striving to get better.” Anthony Wilhite said. A look at some of the unsung heroes from area high school football teams this season. “To help out the team, help out the program,” Laurenza said. “Change the culture,” Runkle added. All solid reasons to stick it out, to come to practice every day, to battle for the Trappers despite unimaginable odds. This is athletic competition, of course, so in theory there is always a chance. But seriously, the Trappers had virtually no possibility at winning a football game this season. The Fort program deals with grade issues, discipline issues, and family issues, too, that might keep players from the practice field. Losing by an average of 39 points per game can take its toll. Still, these seniors tried to find something good in this long season. It was clear these Trappers did improve throughout the season, too. They did not score in the first three weeks of the season, but would get multiple touchdowns in three of their next four games. Wilhite, it can be argued, had the best individual performance for the Trappers this season with 223 yards receiving and three touchdowns in a loss against Kelso. Then there was the Week 9 game against league champion Mountain View. Again, the scoreboard accurately noted the game was a shutout. On the Fort Vancouver sideline, though, it felt like anything but a blowout. Laurenza had a great catch and run. The defense made a few big tackles. The Trappers were not going to win, but they also were not going to allow their opponent to dismiss them. Mountain View would have to earn it. On the sideline, the Trappers were going crazy for their teammates on the field, cheering every positive play, every positive effort. The Trappers recall last season the sideline was quiet, too quiet. Dead silence at times. Not this year. The players not in the game remained engaged, all through Week 9. The eight seniors pretty much played every down for the Trappers. Maybe a break here and there, but for the most part, they played offense and defense. Fort Vancouver had a freshman team this season. Those are the future warriors. Today’s seniors expect them to be better. Wilhite said he wants the younger Trappers to remember the seniors for the struggles they endured, the effort they gave, and how they tried to change the culture. Above all else, stick together. “I want the young people to know we did not give up on each other,” Myron Lawrence said. That has to count for something. In fact, it counts for just about everything. The eight senior football players for the 2018 Fort Vancouver Trappers should feel good about themselves. They won just by being there, setting an example, and showing the way.